Advanced First Aid - F.A.S.T. Rescue Inc.
As a Red Cross authorized provider, F.A.S.T. Rescue offers the Emergency Medical Responder Program. This course is designed for people involved in providing emergency response including fire fighters, police, EMS. It meets the National Occupational Competency Profiles for the practitioner level of emergency medical responder (EMR) established by the Paramedic Association of Canada (PAC). The course provides the knowledge and skills necessary in an emergency to help sustain life, reduce pain, and minimize the consequences of injury or sudden illness until the next level of health care takes over. It follows the latest First Aid & CPR Guidelines and meets the OHS standards for Advanced First Aid. Emergency Medical Responder certification is valid for 3 years and includes CPR Level HCP and Automated External Defibrillation (AED). As a Red Cross authorized provider, F.A.S.T. 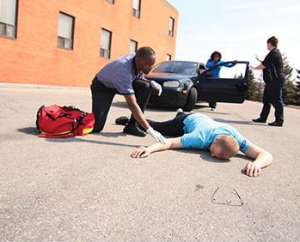 Rescue offers the First Responder Program which is ideal for people who are or wish to be first responders. 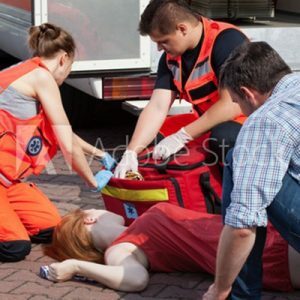 Our First Responder course is designed for professional first responders or those wanting to become first responders to learn pre-hospital care and CPR skills, such as sustaining life, preventing further injuries, and caring for illnesses and injuries until the next level of medical personnel arrives. This course includes the newest First Aid & CPR Guidelines and meets Federal regulations and a variety of provincial/territorial requirements for Advanced First Aid. First Responder certification is valid for 3 years and includes CPR Level HCP and Automated External Defibrillation.